For those among us that enjoy theatre, music, wine tasting, tours and festivals, this will be a Cape May vacation to remember! But not just because you’re going to just love our Cape May NJ vacation rentals. There’s plenty of things going on over the next few weeks that you won’t want to miss and if you’re vacationing in the area now you’re one of the lucky ones! The following events are all close to the Cape May NJ vacation rentals that we have available at this time. 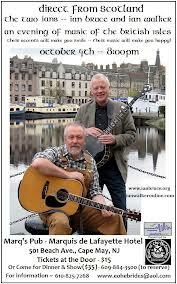 Direct from Scotland, Ian Bruce & Ian Walker an evening of music of the British Isles on Thursday, October 4 at 8 p.m. This ticketed event is held at Marquis de Lafayete. Tickets at the door are $15 or come for dinner and show for $35. Call 609-884-3500 to reserve, or for info call 610-825-7268. Cape May’s 40th Annual Victorian Weekend will take place from Friday, Oct. 5 through Tuesday, Oct. 9. Enjoy a weekend of of exciting and entertaining activities featuring the Chocolate Championship Tour & Tasting, Historic House Tours, Murder Mystery Dinners, Vintage Dance Weekend, Living history programs, lectures, workshops, performance, and more. For more info call 609-884-5404 or 800-275-4278. For the 6th consecutive year, the historic Cape May-Lewes Ferry Terminal will be the setting for the Annual Cape May Wine Festival sponsored by the Garden State Wine Growers Association on Oct. 6 and 7 from noon-5 p.m. Admission is $25 for either day or $40 for a two-day pass. The fee includes a wine tasting glass. Tickets can be purchased at the admission tent 11:30 a.m.-4:30 p.m. each day. Advance tickets are $20 and can be purchased online at newjerseywines.com. All ticket purchases on-site are cash only. Large groups and bus groups can call 609-588-0085 for more information. Admission includes a souvenir wine glass. The Victorian Weekend Crafts and Antiques is on Sunday, Oct. 7 from 10 a.m. to 4 p.m. at the Emlen Physick Estate, 1048 Washington. Sponsored by the Mid-Atlantic Center for the Arts & Humanities. Call 609-884-5404 for more information.